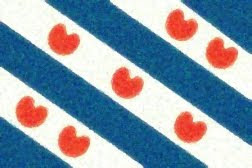 Fun With Frisian: GRINS - "border"
Grins is the West Frisian word for "border" or "frontier" and is said with an "ay" like in "day." It sounds a lot like the English word "grains." GRAYns. In grins tusken twa gebieten. A border between two areas. We've looks at in before, meaning "a" or "an." Say it with a schwa. UHn. Tusken means "between." The first vowel is pronounced with that purse-lipped "o" with an umlaut over it that we saw back in the lesson on dandelions. The second syllable takes a schwa. TÖSKuhn. Remember, twa means "two" and was discussed a few lessons ago. TWAAH. Finally, gebiet is the word for "region," "area," or "country." The first syllable is said with a schwa. The second syllable is said with a long "ee" as in "beet" with a schwa after it. GUH-BEE-uht. The plural ending -en is also pronounced with a schwa. GUH-BEE-uht-uhn. GRAACH - "willingly, readily, heartily"
KEAL - "calf" / "When Pigs Fly"